Here wine has been made since the 10th century AD, just after the invading Moors were sent packing by the Portuguese brave-hearts. Over the centuries and the manners of time, a wine culture has evolved, most of which centred around small producers growing work-horse grapes and making bulk wines of the faceless anonymous variety. Things started changing 35 years ago as various wine crafters looked around the slopes and between the dank-smelling earth deep in clay and chalk, and decided that besides pigs and rural appeal, Barraida could be a bit of all right. The way was led by Luis Pato, an engineer who had inherited a patch of vines and decided to use his natural strong-headedness and academic training to make a play in showing what Barraida can offer wine-wise. With 14 000 vine hectares in the region, the major variety Pato has to his disposal is Baga, a work-horse red, cropped heavily and traditionally shipped off northwards for making the famous Mateus Rosé wine by the gazillions of litres. On the white side is Bical, a firmly textured grape with starry acidity and a fondness for being aged in old barrels. 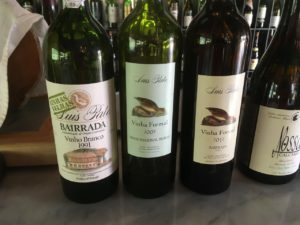 A recent tasting of Barraida wines, mostly Baga and Bical, offered a glimpse of this Portuguese region currently receiving substantial bites of media-airtime. Not only because of Pato’s status as a local legend and wine pioneer, but through the buy-in of other winemaking glitterati, including Dirk Niepoort. The tasting of the whites comprised vintages from 1991 to 2017, and in retrospect this line-up should have followed on the reds as the brightness and life showed here made the Bagas appear clod-like. All the whites had a Luis Pato connection: three of the great man’s own offerings and one wine from his daughter Filipa who is set to ensure the legacy of Pato and Barraida continues. 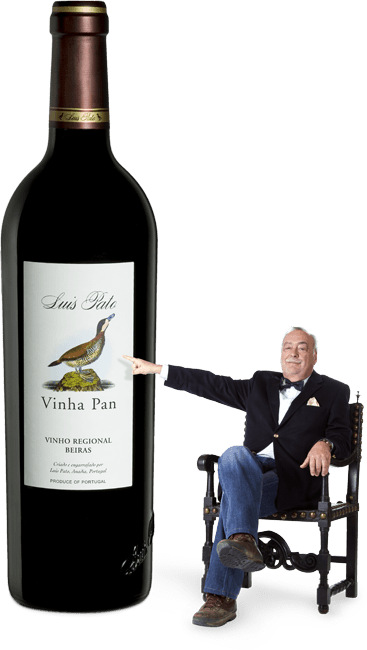 The oldest wine was a Luis Pato Bairrada Vinhas Velhas Branco 1991 – 50% Bical and 25% Cerceal and 25% Maria Gomes, the latter variety also going by the name of Fernão Pires. It showed the beginning of Pato’s influence on Barraida white, dropping yields and using new wood. This wine was fermented and aged in new barrels of 650 litres, the maturation period being six months. Besides being deliciously crisp, complex and lucid, this wine, as well as Pato’s Vinha Formal 2003 (100% Bical), gave good cause to rethink what is considered as “old” wine. Especially for South Africa, where whites aged for five years are considered “museum class”. Really? 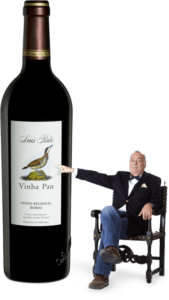 Pato’s Vinhas Velhas as well as the Vinha Formal, 28 and 16 years old respectively, showed not the slightest edge of age, oxidation or flabbiness. They were not youthful, but had matured with grace and confidence. The older Velhas had a fruitier edge, possibly due to the portion of Maria Gomes, but was still eager and frisky in its offering of pear-drop, sour green plum and white fig flavours. The perky acidic edge does not only rejuvenate the wine, but the drinker as well. The Vinha Formal 2003 shows the potential of Bical to take its place as one of the great white grapes. Pato uses the same wooding regime as for the Vinhas Velhas, and the wine is crunchy, cool and green, enough so for you to almost taste the misty wet slopes of the Barraida valleys and to hear the nervous squeals from the pig-pens as the butcher’s truck pulls up. A younger Vinha Formal Bical 2017 proves that as glorious as it is in its older age, the white from Barraida is anything but offensive in its sprightly youth. Although the eye-watering loveliness of the mid-palate – as presented by the older wines – is not yet present, the younger Bical is ready, willing and able. Chablis-like wet chalky rock and just-shucked oyster shell abound, with some spring white flowers and melon-rind offering clarity and colour to the palate. And knowing that this wine is still to become shaplier, confident and louder over the years ensures it commands the sort of respect giving it that extra edge. That tuning-fork, attention-grabbing wow-factor everone is looking for. It is here. Red Baga is what Barraida is actually known for, over 20% of the region’s vines planted to it. And my first few experiences are memorable for the tough, irony and weedy characters of the jug-poured Bagas accompanying plates of things grilled and things porky. But it is Baga that has led to the Barraida revolution, with Pato, Niepoort and eight or so other similarly-minded wine crusaders seeking to show the world that here in Portugal is a red grape capable of garnering the allure of Nebbiolo from Barolo and – more ambitiously – Pinot Noir in Burgundy. If the line-up at this Barraida tasting was anything to go by, the dream is unfortunately going to remain just that for another couple of years, if not decades. The Luis Pato Bairrada Vinhas Velhas Vinho Tinto 1997 should have provided a glimpse of something special from Baga. But despite the fact that the wine was healthy, fresh and alive, it had little to offer in terms of layered flavours and assured palate presence. At 11 years old, Pato’s Vinhas Velhas 2008 Baga was a pretty neutral wine for something made from 50 year old vines, and I was beginning to wonder if my palate had not been spoilt by the sunniness and broad canvasses of South Africa’s current red wine offering. The red wine of the day, for me, was Filipa Pato Baga Nossa Calcario 2016. Made by Luis’s daughter from 100 year-old Baga vines. 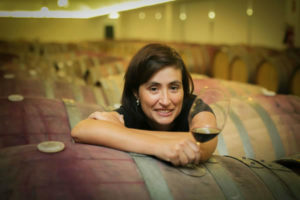 Unlike her dad, Filipa ferments in open concrete fermenters and gives her wine 20% new wood. Luis prefers stainless steel for the ferment and old wood on red. Though still a youngster, Nossa Calcario gives one a glimpse into the potential of Baga. It is a polished wine with vivid tannins and a glossy presence in the mouth, but most important for me was the line of cherry, prune and bramble. At last, a hint of fruit and a reminder that there was some sun around to ripen the stuff. 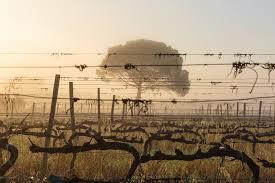 But for now, if it is great wines one is looking for, it is found in Barraida. And the name is Bical.